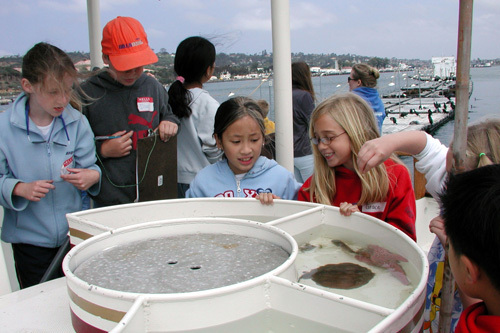 The Floating Lab field trip is the first of the traditional field trips that are true San Diego classic experiences, that parents, if not children, hear about years in advance and look forward finally getting their turn. 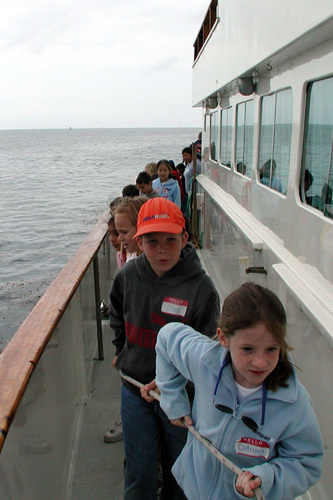 Not every school child can go on a field trip to an ocean bay to gather and examine wildlife. There were three classes and two boats. Doug's class was unfortunately the one split. 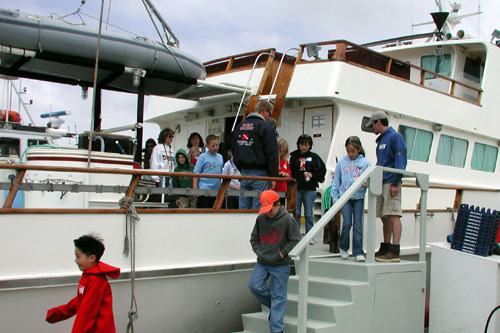 Two car pools went on our boat, while the teacher and the rest of the car pools went on the other. 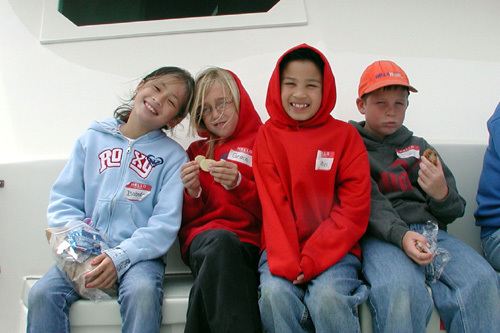 So our boat was half our class and another third grade class. That's 30 kids a boat. This was not a small boat. 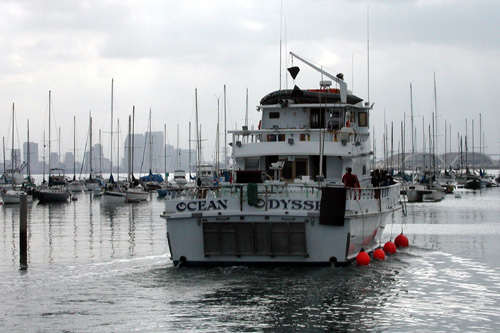 It was not a fishing boat, but a dive boat, rigged to support scuba divers. This would serve our oceanographic needs well. 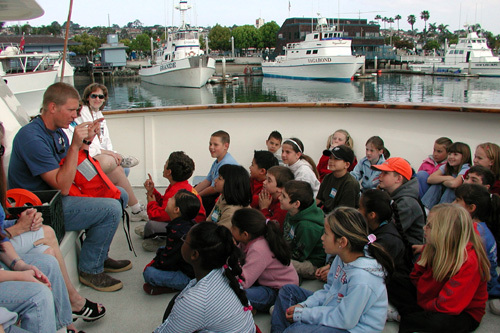 The first order of business on the boat before it left the slip was an orientation for the kids: what they were going to do that day, ship's rules, and of course instructions regarding the life jackets. The instructor was great with the kids, and kept their rapt attention. The other boat with the rest of the class departed first. Here it goes into San Diego Bay with downtown on its left and the jet hangers of Coronado's North Island Navy base on its right. The first work on board was to cast a net. Volunteers were requested. Doug refused to volunteer (for anything) because his brother had told him not to; that if he volunteered he would get a lobster on placed on his head. After the volunteers had cast the net, it was time for everyone, volunteer or not, to haul the net in (as the boat was moving) to see what was caught. 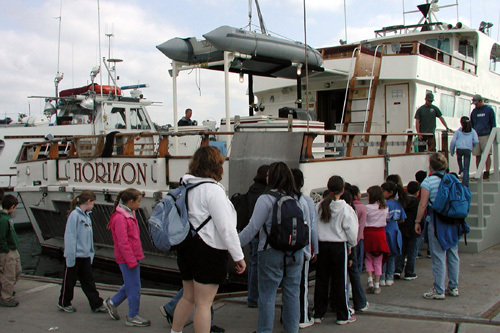 A line of students went around the boat in a counter-clockwise circle, grabbing the rope and pulling it with them up the starboard side of the boat. Keith was tagged to be barrel man, taking the rope from the moving line of kids as they brought it forward and laying it in the barrel. He is convinced he got this job because he was the only father on board (although there was nothing particularly taxing or physical about the job). Items were collected from the net and placed in a water barrel. If a particularly important or interesting animal was not captured in the net, it was produced from on board holding tanks and thrown into the barrel. 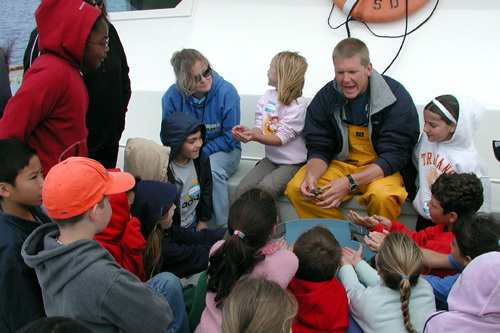 The barrel was then taken forward, and Jesse our oceanographer explained each of the creatures, which included a sting ray, sponge, a California halibut, a crab and a lobster. Yes, the lobster was put on someone's head (but not Douglas'; he stayed well back). 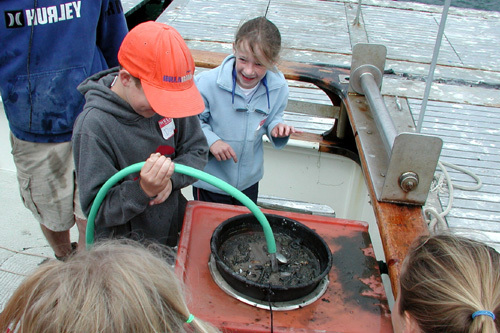 After exploring the creatures in the bucket, the kids broke up into teams to perform oceanographic experiments. Here Douglas is washing muck retrieved from the bottom of the bay. 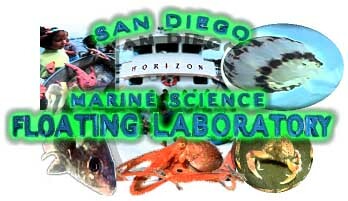 They discovered mussels, decorator tube worms and hermit crabs. 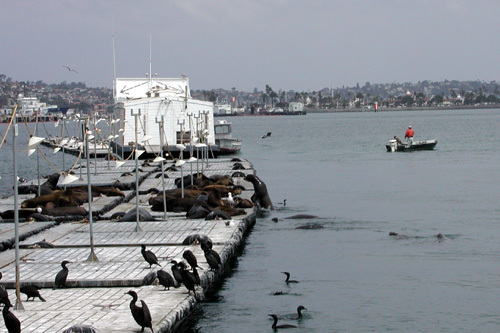 California sea lions and cormorants combined to really stink up the bait docks where we stopped to do our oceanography. After the mud sample, we moved on to the holding tanks were the kids had the opportunity to touch each of the animals captured in the net. 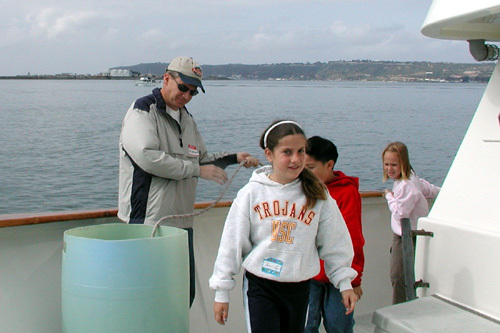 Doug holds the clipboard where they recorded their oceanographic observations (e.g. "the starfish felt like pebbles"). 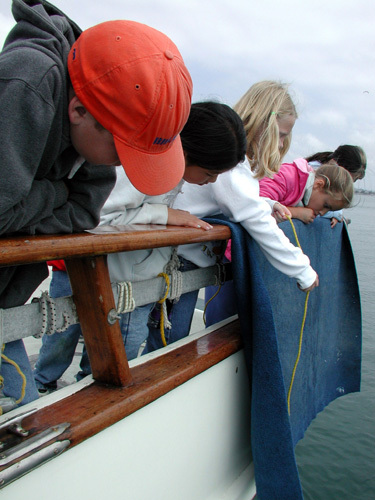 There were additional experiments to determine water depth, temperature, clarity, wind speed, and tide direction. Finally there was the plankton experiment. We ran out of time and didn't collect our own sample, but Jesse was prepared with some sample ocean water himself. 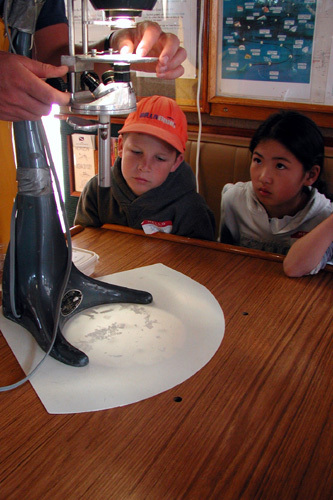 Using this interesting projection system, everyone got to see the plankton (or at least its shadows) moving around. That concludes the oceanography portion of our cruise. Now was a slow ride back to the pier while we ate lunch. 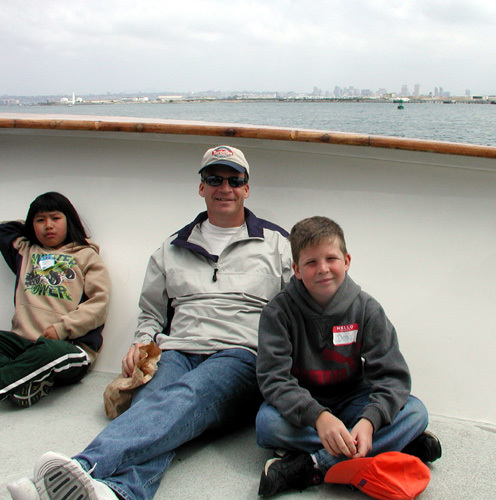 Here are Keith and Doug and the San Diego skyline. Douglas was a lot less thrilled, it seems, to get his picture taken with his classmates. Maybe he was just tried of pictures by this point. And that was the end of our three hour tour.